Tim Thorpe | Chicago's Pipe, Cigar & Tobacco Store | Iwan Ries & Co. Above all, I consider pipe making to be a form of art as well as having functionality. Each block of briar is different and holds potential that must be revealed with in the production of the pipe. The possibilities are endless when it comes to shapes and finishes , I strive to produce the best possible pipe with engineering and design. 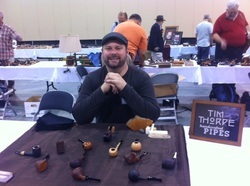 Pipe making for me all began back in 2006, like many other carvers I bought two pipe kits form Tim West, After making them I had a passion instantly . Tim West has been a big inspiration in my pipe making career, I would not be were I am today without his guidance and help. All my pipes are made one by one with close attention to detail, I use only the best briar from all around the Mediterranean and that is cured some additional time in my shop, I primarily use Italian briar. All my stems are hand cut from Ebonite, bakelight and some special acrylics. I also incorporate the use of Exotics materials such as pre ban ivory, horn, silver and different woods for stem inlays. producing something with your hands is very rewarding, this is what compels me to make the best pipes I can make and I learn more with in each pipe crafted .